.....when the boys are happy and I am with them...yes simply that! Yesterday I took William and Henry to MV Doulus. 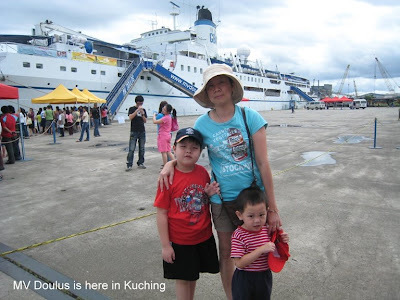 Doulus is stopping over in Kuching till 3rd Jan 2009. Been here since 10th Dec. The last time I was on it was more than 5 years ago when William was still in my" womb" :). They have never been on a "big" ship before so this is such a special occasion for them.